1. Editorial : Susan Koshy writes on the recent Pulwama attack and suggests the removal of Articles 35A and 370 to bring Kashmir into National mainstream. 2. 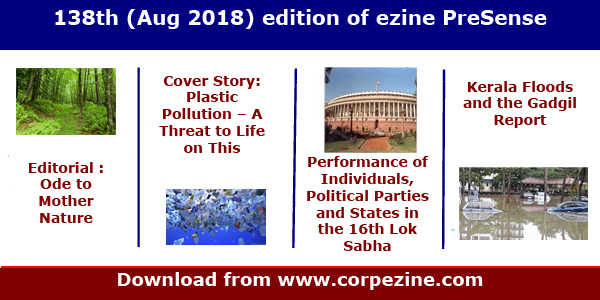 Cover Story 1 : Prime Point Srinivasan analyses the performance of 16th Lok Sabha and compares with 14th and 15th Lok Sabha. 3. Cover Story 2 : PreSense has developed a new tool to evaluate the performance of Lok Sabha. This tool 'PreSense Lok Sabha Index' is launched in this edition. 4. 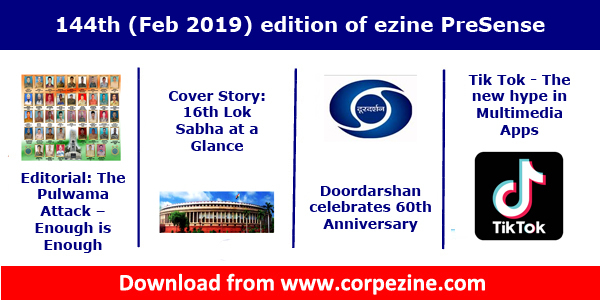 Nation : T N Ashok writes on Doordarshan, which turns 60 during 2019. 5. Technology : V Rajendran writes on the hyped 'Tik Tok' App. 6. Triambak Sharma presents 3D Prince cartoon. 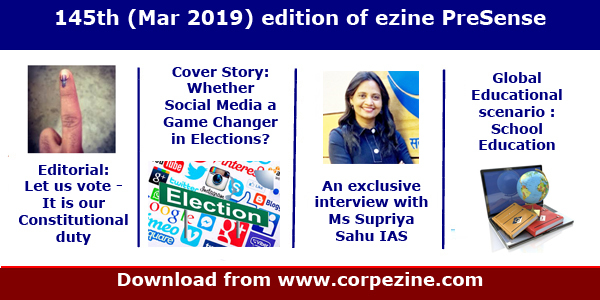 Editorial Team is pleased to release the 143rd (January 2019) issue of your eMagazine PreSense broadly with the following contents..
1. 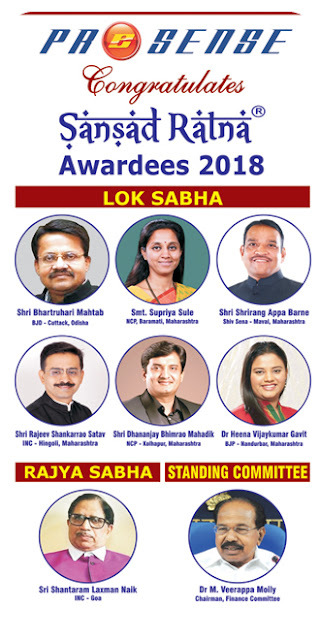 This edition is a special edition focussing on the prestigious 10th Anniversary of Sansad Ratna Awards event held on 19th January 2019 at Durbar Hall, Raj Bhavan, Chennai. As readers are aware, 'Sansad Ratna Awards' is one of the top initiatives of your eMagazine PreSense, started on the suggestions of Dr APJ Abdul Kalam. 2. 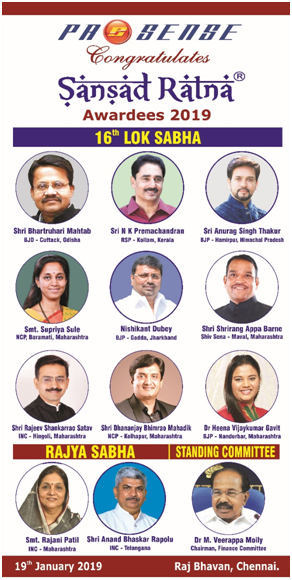 We have also listed the 'Heroes' of 16th Lok Sabha, who have received the coveted Sansad Ratna Awards 2019 from the hands of Shri Banwarilal Purohit, Hon'ble Governor of Tamil Nadu. 3. 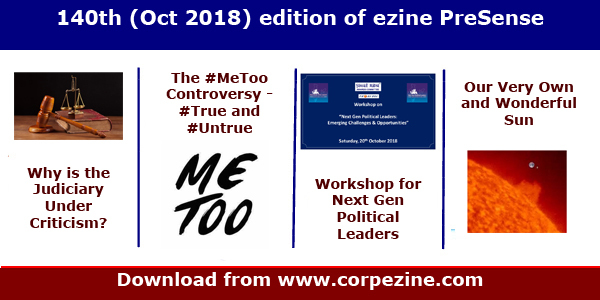 We have brought out a special Editorial titled "Celebrate Heroes, Not Anti Heroes" appealing to all political parties to encourage young and vibrant leaders within their own ranks. 4. 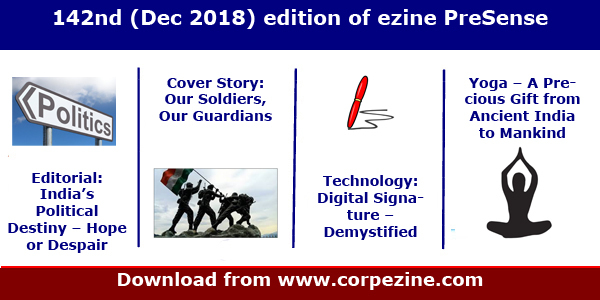 During January 2019, Digital Security Association of India (DiSAI), another initiative of your eMagazine PreSense also organised a full day seminar on 'Digital Security'. 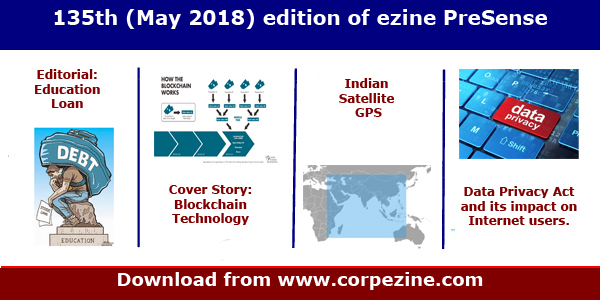 We have covered the details in this edition. 5. 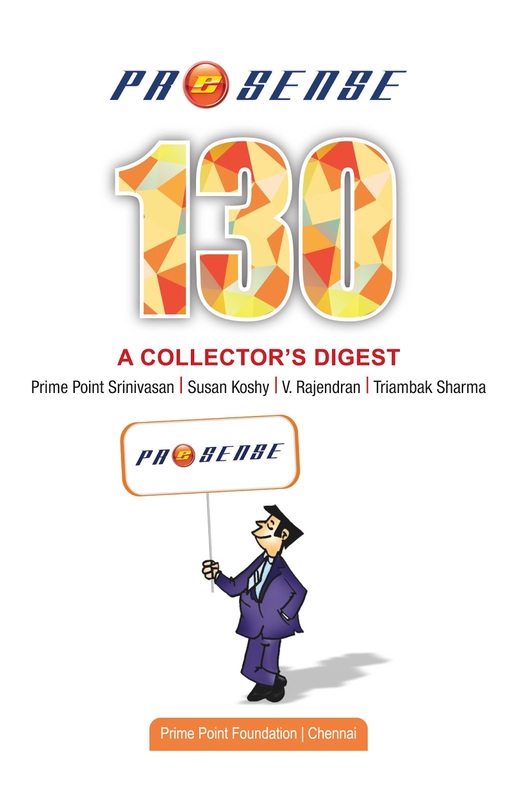 From this edition, Triambak Sharma is brining out the Prince cartoons in 3D format. Please enjoy the 3D cartoons in future. 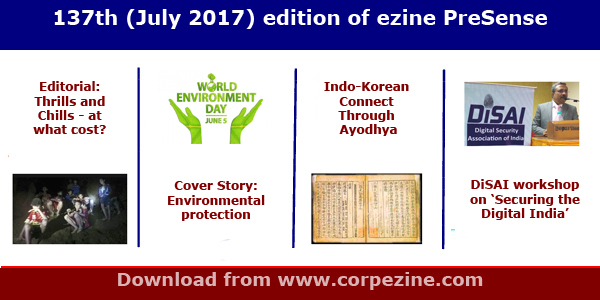 The eMagazine may be downloaded form the following link also. We are confident that you will continue to enjoy this edition too. 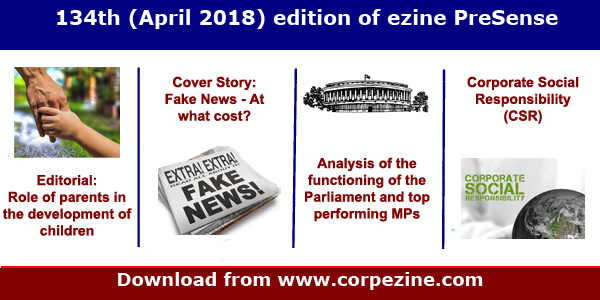 You may kindly give us your feedback to editor@corpezine.com. Please share this edition with your contact. 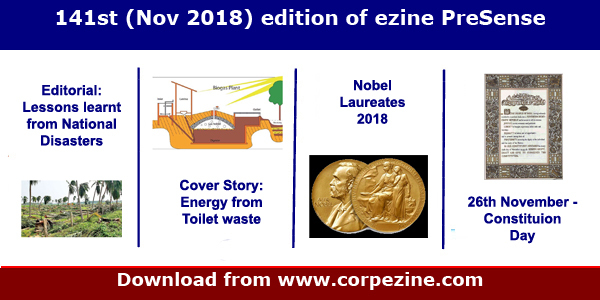 Editorial Team of eMagazine PreSense wishes all the readers and family members a very happy and prosperous New Year 2019. May the new year bring all prosperity to our Nation. 3. Feature : Susan Koshy brings out an inspiring exclusive interview with Maj Gen Binoy Poonnen, AVSM, VSM, Mahar Regiment (Infantry) (Retired), whose family has contributed 21 members running through three generations to the Armed forces. 4. Technology : V Rajendran writes on Digital Signatures. 5. Health : Dr R Jagannathan writes on "Yoga - a precious gift from ancient India to mankind"
6. Announcement : Editorial Team announces the 10th edition of Sansad Ratna Awards event, an initiative of this eMagazine PreSense. We request you to kindly share this with your contacts. 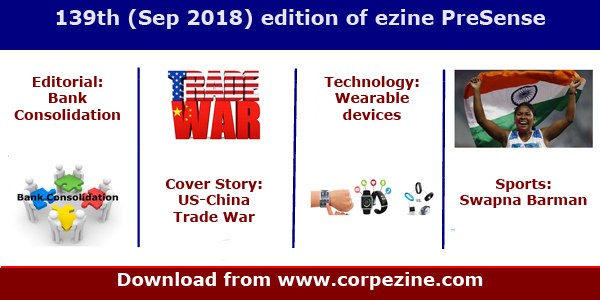 Please share your feedback to editor@corpezine.com .